Welcome 2019 with special sips and a pajama dance party. Snooze near the sardines and sharks at this annual, oh-so-special event at the Cannery Row landmark. AMONG THE FISHES, in a place that brims with wonder and science and fantastical sights and deep knowledge throughout the year? 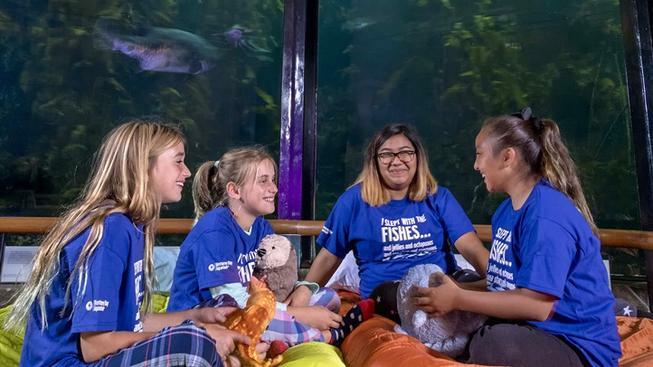 It's Monterey Bay Aquarium, yep, that we're talking about here, and the Cannery Row landmark will once again open for one especially special sleepover, a nighttime event that will take revelers from one year to the next. The leaping-off year is, yes, 2018, the year you'll land in is 2019, which means you'll be stretching out at the aquarium, in your sleeping bag, on Monday, Dec. 31. SEVERAL THINGS ARE PLANNED... for this memory-maker of a bash, including a pajama dance party, a sundae bar, and a toast to 2019 (sparkling cider'll be in the glasses). It is, indeed, family-oriented, so round up the kids and/or grown-ups for an end-of-the year trip to the peninsula. Guests should be 5 and up, it all begins at 7 p.m. on New Year's Eve and wraps at 8:30 the next morning, and a ticket for a non-member is $155. There's lots to know, of course, including sleeping areas, so swim this way, NYE party people.